Can the joys of chrome and vinyl negate the pain of rockets up the tailpipe? 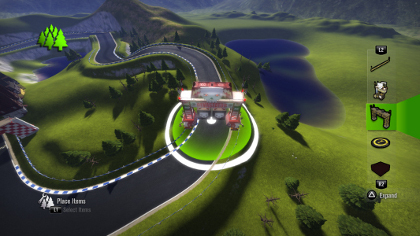 VGD goes hands-on with an offline build of United Front’s PS3 kart racer. However cheekily it may draft LittleBigPlanet’s slipstream in many respects, United Front’s ModNation Racers does veer away from the Media Molecule champ in one (besides being a kart racer, of course). It’s possible to peg out and test-drive a custom level in moments, rather than the hours, days and weeks we’ve plunged into Sackpeople habitats. The means of doing so, what’s more, are pleasantly idiot-proof. 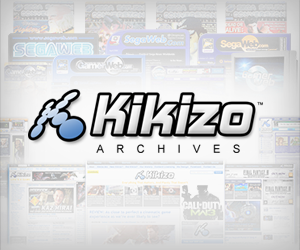 There’s no clumsy jostling of cursors with an analog stick, or cowardly defaulting to mouse and keyboard: you create a race course simply by driving it, carving up a blank canvas at the wheel of a magic steam-roller. Curve back round to the finish line (or hold X to auto-complete) and hey presto! one fully playable, uploadable and rate-able automobile graveyard. Decorating the course and pencilling in speed pads and the like won’t take much longer. If plonking down novelty volcanoes, beachside undergrowth, ski lodges or aircraft wreckage bit by bit sounds arduous, just hit auto-populate, paint an area and the editor will do the donkey work as appropriate to the environmental template, leaving you to prune the results. Got a finishing line? Then you're done, basically. Towards the more complicated end of the prop box, there are dynamic hazards like flame jets and crusher blocks, which may be linked to visible or invisible trigger pads. Drops in the ocean of LittleBigPlanet’s feature set, yes, but enough to afford a little tactical thought. Position a trigger just after a set of traps, for instance, and front-running players will be able to make life difficult indeed for those a few car-lengths behind. The route itself can be raised, lowered, pitched, flooded, narrowed or widened, recoated with trustworthy tarmac or treacherous sand and gravel, infested with clockwork robots and pinball-machine style bumpers, split down the middle to create shortcuts, hacked into sequences of perilous platforms and jump ramps, and a fair few other things besides. The interface is a little fiddly, particularly when it comes to picking individual course components out of the mass, but video tutorials and a control layout screen (one per tool) – not to mention the all-important “undo” and “redo” commands – are mere taps away, and the menu structure scales agreeably from radial hub to lateral quick-select to detailed square grid format. This disgraceful skat3rboy caricature is the campaign protagonist, but fear not - you can easily transform his look. 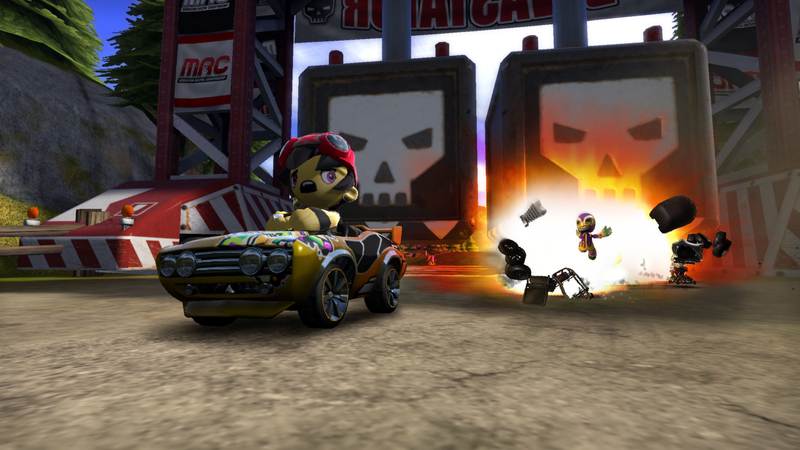 ModNation Racers is a fun, intelligently assembled level creation toolbox, then. What it isn’t, so far, is an essential racing game. The genetic code is obviously that of Mario Kart – drift, boost, fire weapon, repeat – but the rough spots are rougher and the shiny bits not quite as lustrous. 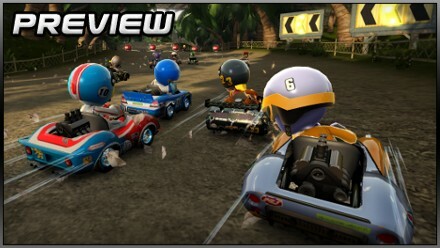 Posted in Previews, Spotlight, and tagged with Canada, Europe, multiplayer, North America, racing, social networking, Sony, UK, USA. LOL. sounds like this guy is cranky due to losing too many races.